When I began at Warmboard, things were in disarray. There had never been a professional designer on staff, and no marketer had lasted at the company for more than 18 months. The product was fairly well known in the industry, but had been hit hard during the housing crisis and recession. I began with the goal of revitalizing the brand, overhauling the marketing strategy and meeting the needs of the field staff. 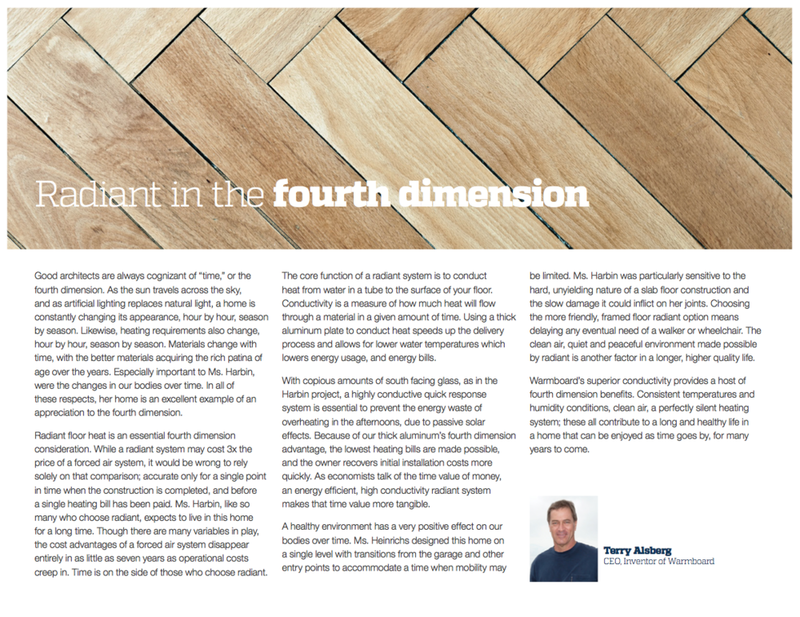 Unlike most building products, Warmboard is sold direct, but their current market method relied almost solely on one-on-one meetings with trade professionals. Effective, but time consuming with no real path to aggressive growth. With a limited budget, I re-prioritized the budget to focus efforts on attracting the homeowner. This was a bit of a fundamental change, but an effective one. Sales could continue meeting with the trades, and we could utilize our website and new social channels to inform and attract the homeowner. This approach would increase sales and aid in the trades holding spec. After updating the design and copy on all marketing materials (white papers, website, messaging...) to be more clear and concise, all materials were redesigned with a new color scheme and typography. Numerous social channels were created, and blogging became more regular. 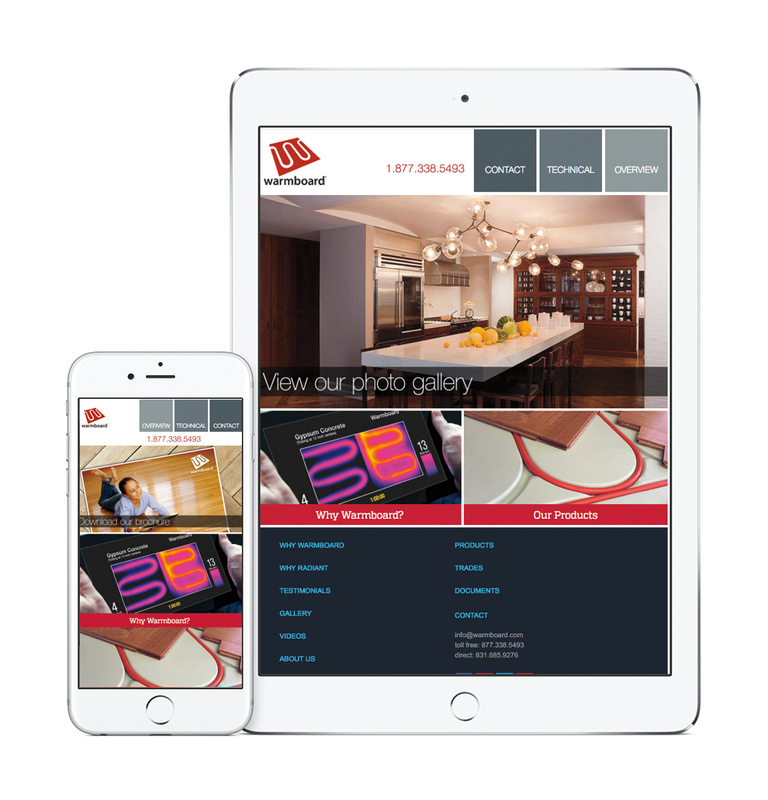 Content/Sponsored Marketing was made a top priority and we partnered with numerous home building and design websites. Finally, I engaged with online influencers to generate awareness and make Warmboard the go-to hydronic radiant solutions for those remodeling or building their own home. Today, brand recognition is at an all time high. More and more projects are sold via the homeowner than ever before and the company has nearly doubled its sales in the last 5 years. 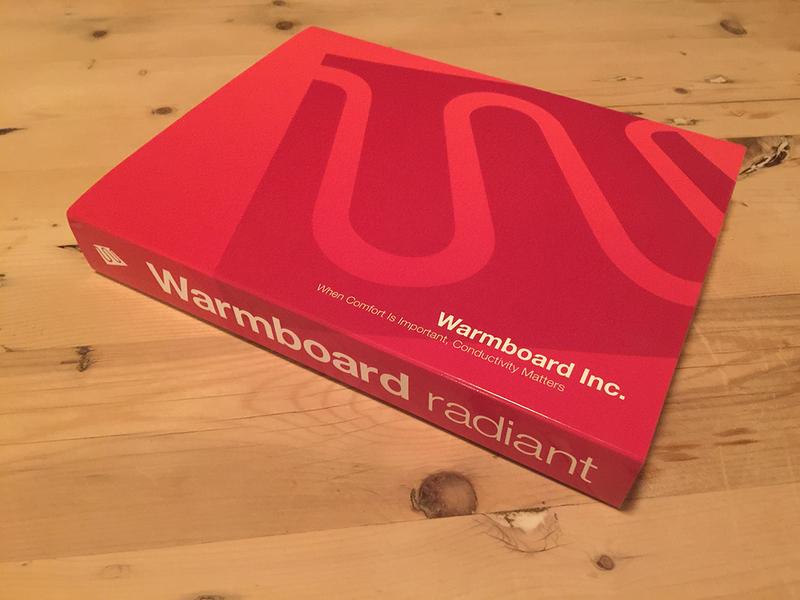 Warmboard continues to dominate the industry and influence continues to grow. I overhauled the company website and streamlined the information and content. I designed the interface, wrote the content and oversaw the development . The site is now second-to-none in the industry. Site traffic is up 15% year over year, leads (which had been declining) are now increasing at over 18% annually. Additionally, leads are more qualified and more knowledgable than ever before, decreasing the number of hours required by Sales staff on each project. Print materials (marketing, technical documentation) were redesigned in a horizontal format to fit in our Introductory Package (below) as well as for easier reading on laptops, which are common on job sites. In most of these pieces, content was either written or heavily edited. Warmboard-R Installation Guide View the pdf. Warmboard-S Installation Guide View the pdf. (Tubing & Manifolds Installation Guide View the pdf. Design. Copywriting. Production. This brochure is included with our Introductory Package and is available as a registered download on our site, which brings in additional leads each week. Residential Brochure, English View the pdf. Residential Brochure, Mandarin View the pdf. 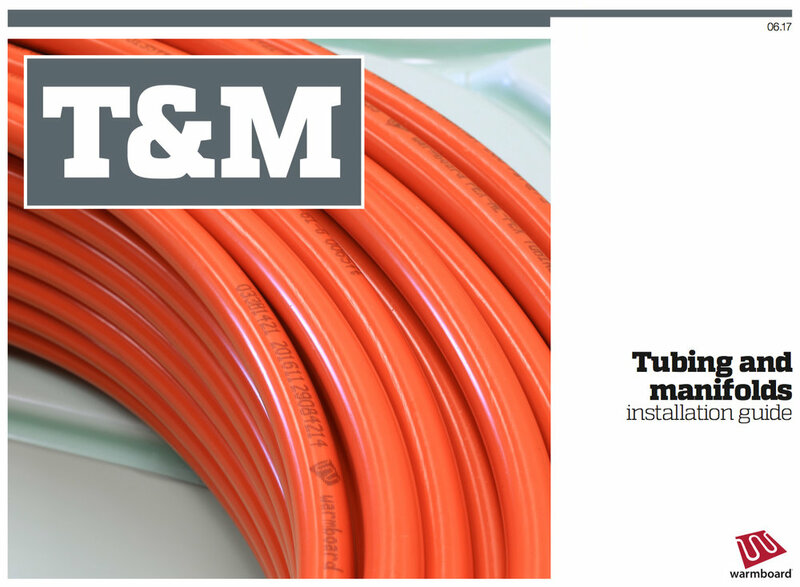 Tubing & Manifolds Brochure View the pdf. 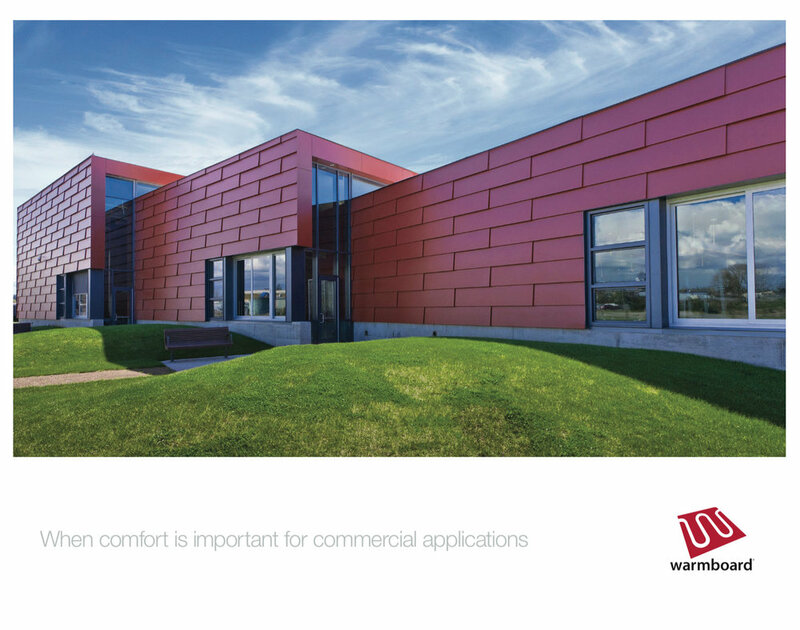 Commercial Brochure View the pdf. Two samples of E-Books produced as part of a Lead Generation campaign. This Introductory Package is sent to qualified leads who are considering our product. The box slides open and contains two product samples as well as a brochure and any additional marketing materials which may be relevant to needs of the client. The product samples are held in place by a hardwood flooring texture, and beneath each sample is an image showing how each product is installed. Warmboard is a premium brand, and the high quality and perceived value of this piece reinforces the quality of our brand with the discriminating homeowner and trades professional. After contracting an independent research firm to do a survey, we received some impressive feedback. Instead of just putting the results on a text document, I put in a few hours after work to create this video. Due to time constraints, it became necessary to shoot this video without a script. I coordinated with the installer and shot using 1 camera, and an iPhone. I asked questions throughout the installation and used the talking points to write a script afterwards, record the voiceover, and produce the video above. A competing product did a bit of a hit piece on us. The CEO wanted to hit back. One in a series of 7 videos comparing Warmboard to competing products. The video was shot using a FLIR camera. I compiled the end result and sped up the video to coincide correctly with the frame rate to generate and accurate "time-lapse" video. Heat cannot be seen. I created this short video to show how heat is generated and distributed by the 3 different primary methods. Known for several popular programs on HGTV, The Cousins are also regular guests on Rachael Ray and Ellen. John Colaneri was building his own home, discovered our product, and reached out. In exchange for a lower price point, John agreed to share photos of his project on his social channels. I helped foster a great relationship with them, and over the following months, our product was getting more attention. 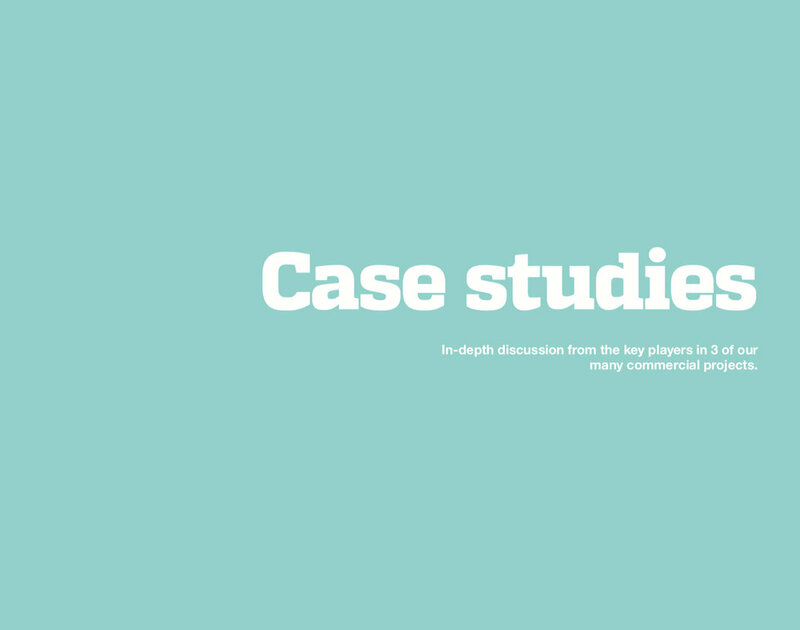 John became a wonderful advocate for the brand, and we proceeded to produce 3 videos with them. Our first video is an broader introduction to the company, focusing on the installation and performance aspects of our products. In our second video, we focus on living with radiant heat from the woman's perspective. While the first video was primarily geared towards general contractors, this is aimed at the homeowner. In the 3rd video, John and Anthony use a thermographic camera and focus on the ability to control comfort room-by-room, and save considerably on energy bills. After the success in our first two videos from The Cousins, I was able to convince the leadership to pursue more Influencers. I connected with Jesse & Alyssa of "Pure Living for Life" – a very popular Youtube channel with over 400K enthusiastic and loyal subscribers. I worked with them to negotiate a contract, and provided the materials they needed to heat their home. While we had little control over the actual script, we did request they highlight several aspects of our products in their videos to help differentiate our product from our competitors. Our product was mentioned in several videos, but 4 [so far] were dedicated almost exclusively to Warmboard. To date, these videos combined for a total of over 1M views. Once you include their other social channels, the results were obviously much higher. This has resulted in a tremendous increase in web traffic, brand awareness and sales. I am currently working with additional Influencers on Youtube, Facebook, Instagram and Twitter to create additional content which will go live in 2018/2019. The combined reach of these Influencers is over 8m. In addition to working with Influencers, I also helped establish relationships with several clients throughout North America. Together, we would produce write-ups about the project we did together. 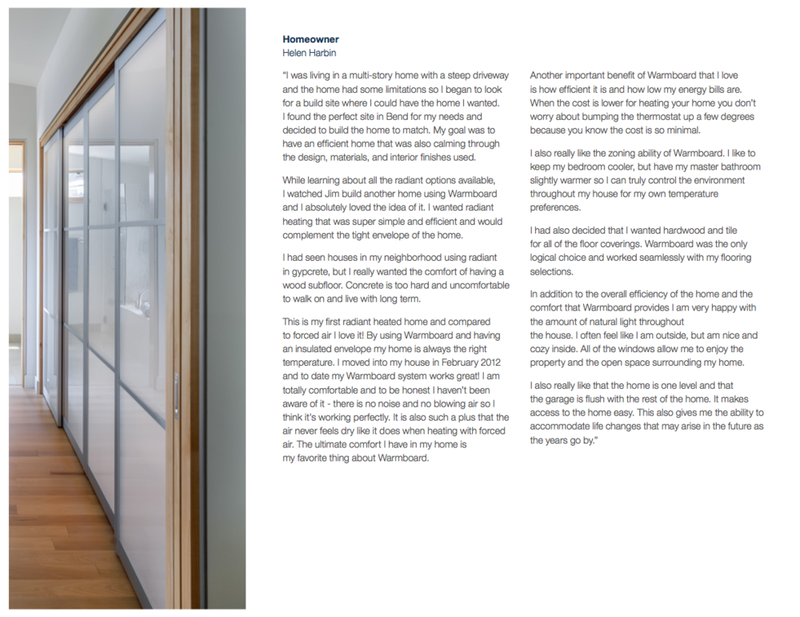 They would provide photos and some insight on their experience with Warmboard. I would take this content, write an article and promote on our social channels and through our email blasts. It has been a very mutually beneficial undertaking for both parties. We get free content. The client gets national recognition and exposure to market opportunities. And it just takes a little effort from both parties, and everyone wins. Here's an example. Even with a limited budget, I was effective at generating awareness through campaigns with Fine Home Building, Bob Vila, Yahoo! and Houzz. This generated tens of thousands of additional hits to our website, hundreds of new leads and tens of thousands of dollars in new revenue while continuing to cement our brand as the industry leader. Hats, shirts, golf balls, notebooks, blankets, backpacks, laptop bags – so many things. Screens and interaction of new thermostat interface.